Let’s start with the good stuff: Carmen’s Deli in Bellmawr, NJ, where you can get authentic Philly-style hoagies. And other things, too, but who cares? Hoagies, man. Hoagies. A Jersey jughandle – follow the blue arrows. 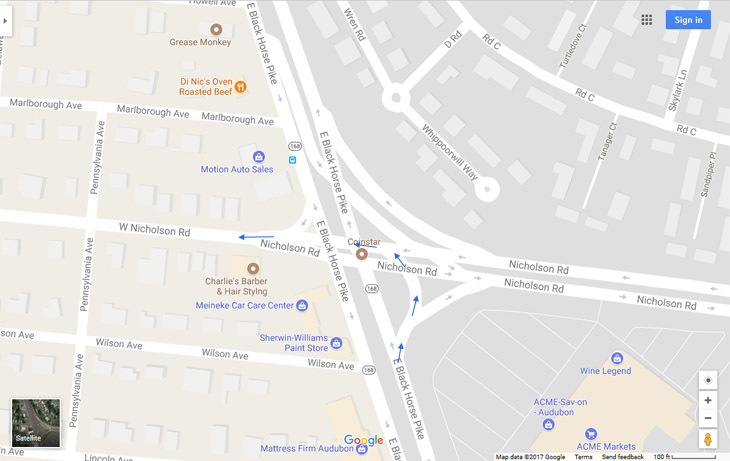 If you’re traveling north on E. Black Horse Pike, you have to bear right to go left onto W. Nicholson. Notice, however, that southbound traffic has a (more or less) normal left-turn lane. You see, I understand the idea of a traffic circle, which more-or-less regulates without the need for traffic lights (as long as people understand the very simple rule of “yield to those within the circle but not if you’re in it and not if no one is coming” I’m looking at you North Carolinians,) but there are lights at each of these junctions. 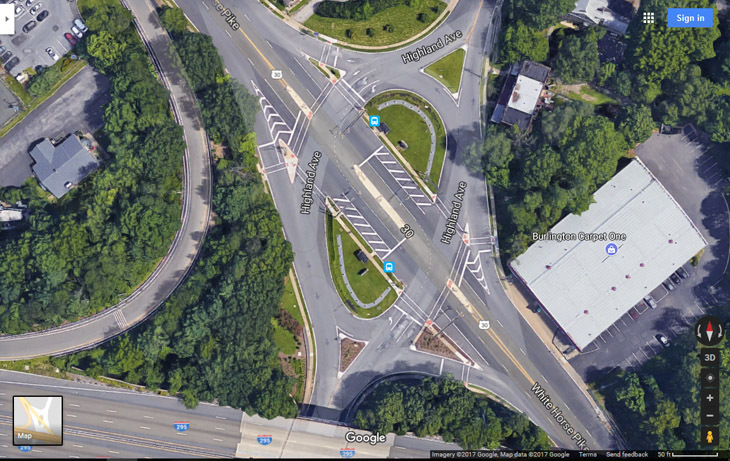 So how does this improve matters over a simple four-way with turn lanes? Ya got me. Okay, on to more topical stuff. 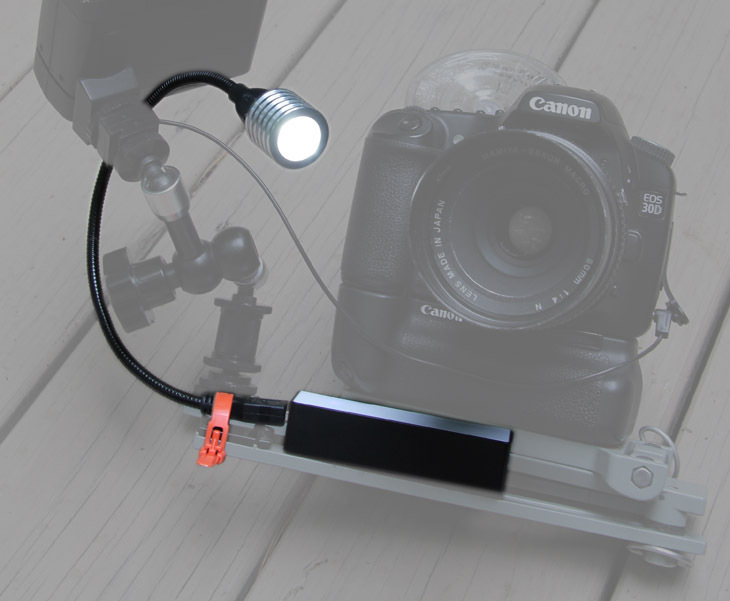 These are the three components of the macro focusing light that I constructed, for only a few dollars all told. At top, the USB power pack, usually intended for recharging smutphones in a pinch, and the 18650 battery that it takes – all I purchased was an empty case, since I already had the battery. It might be best to buy the battery separately so you can get the best deal on the highest milliamp-hour (mah) battery you can find. 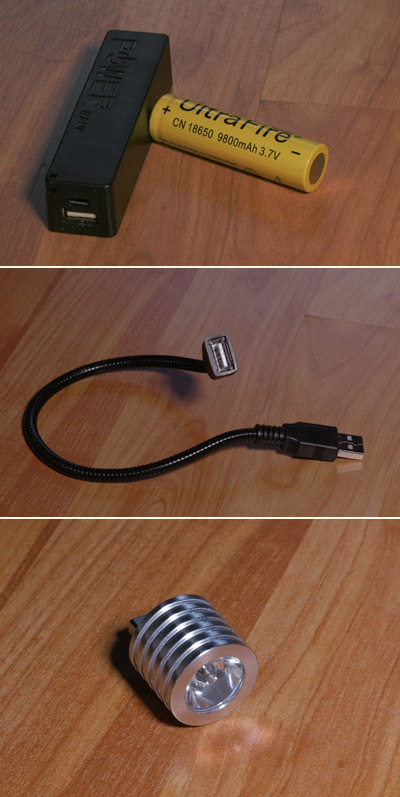 In the middle, the USB gooseneck extension, very stiff and easily aimed as needed. At bottom, the light unit itself, not to the scale of the others but roughly twice as big in this pic – compare the wood grain to the image above it, which is the same stretch of floor. If it helps, the unit is 26mm across, about the diameter of a quarter. And yes, it is bright, and fairly tightly-focused, so ideal for my purposes. The previous version, a homemade rig, can (kinda) be seen here; it worked, but tended to slip position even with hook-and-loop attachments or rubber bands. Some of this was due to the short gooseneck and the necessity to be close to the lens. You can see everything in place with the entire macro rig in the opening photo, but highlighted below to point out the components clearly. The orange zip-tie is removable, and serves to stabilize that end of the gooseneck arm because it doesn’t fit as snugly as needed into the battery pack. But with it, the light remains pointing precisely where needed. 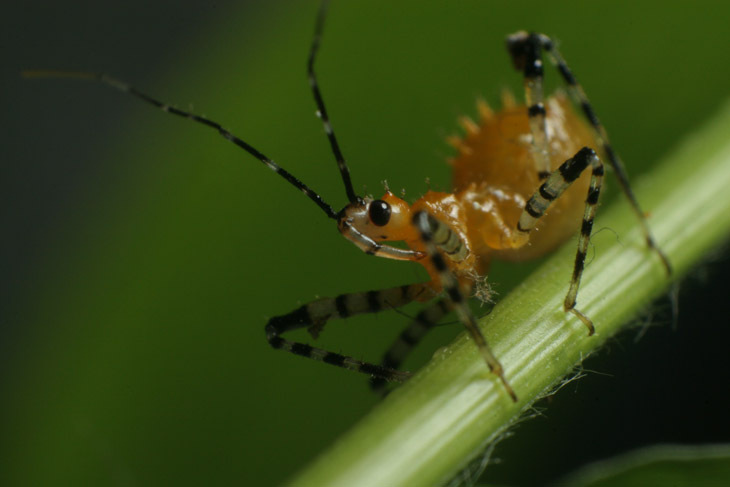 This assassin bug was less than 6mm in body length, making that proboscis 1mm or less, and you can see how short the depth is even at f16 by how quickly the legs have gone out of focus. The stem that it’s perched on is perhaps slightly thicker than a pencil lead. 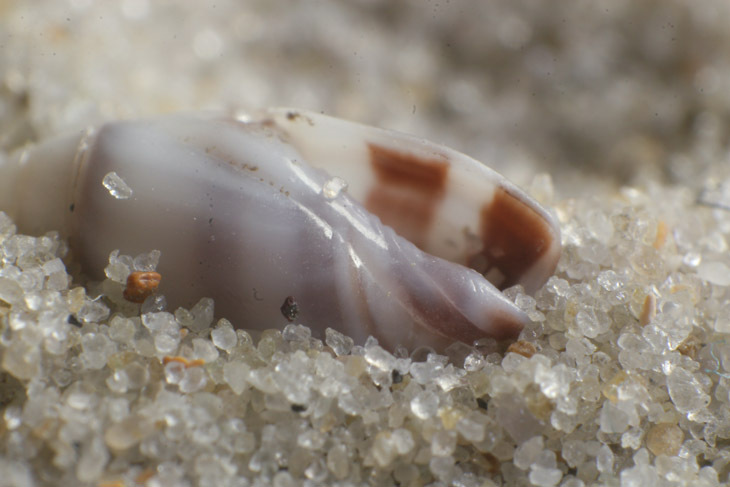 And this is a tiny shell found during the beach trip – those are grains of sand, fine ones mind you, in the foreground and adhering to the shell. The illumination for both of these images came from the flash unit, but the ability to see them and have the camera at the right focusing distance came courtesy of the new macro light. Yeah, it seems to work just fine. I still wear a headlamp when out at night just to find my way around and do the initial spotting of subjects, but the macro light comes into play when I’m focusing; as I said, it can be positioned close to the flash unit itself to throw light from the same direction, to give a better indication of how the light will model and where shadows will be thrown. 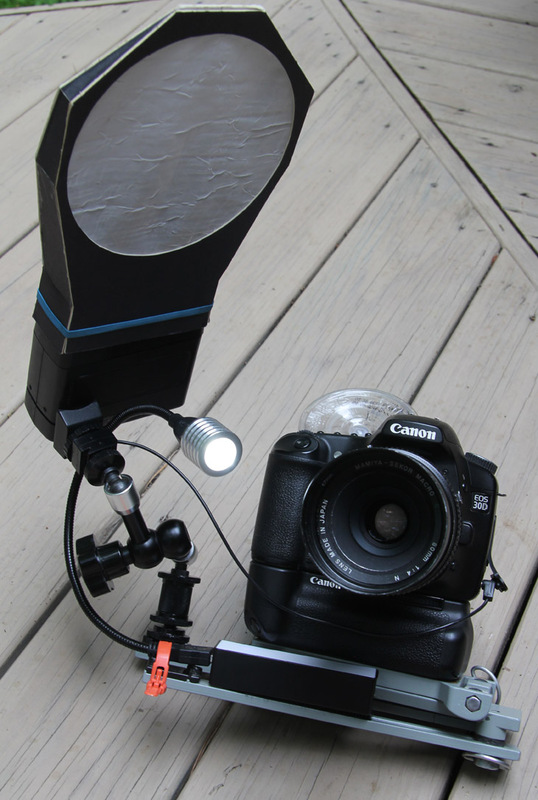 Later on, I might affix another LED directly within the softbox itself, aimed where the center of the flash burst will fall – that way, I know precisely how the lighting will be, and will know when the flash might be blocked by leaves or aimed a little off (which happens more than occasionally.) There are always refinements that can be made. Oh, what the hell. 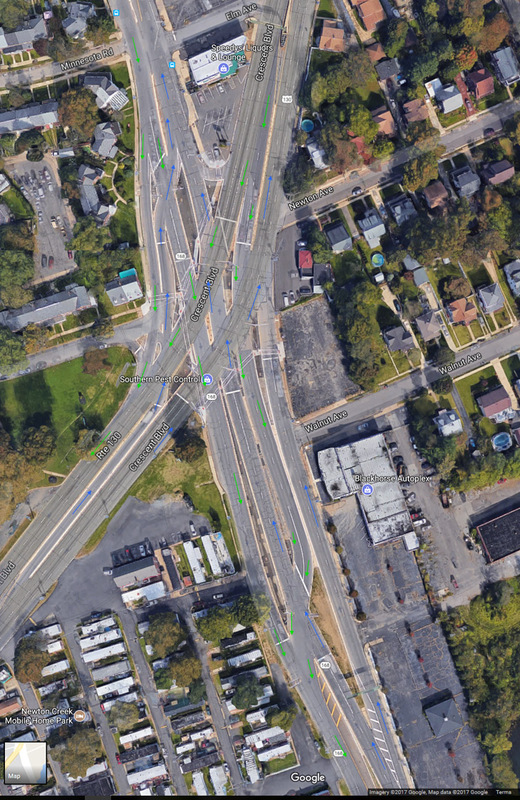 Here’s another example of Jersey boulevard blight. And yes, I drove through each of these – this one was even under construction. I added arrows to help illustrate directions of travel. Once again, all of this in ground level, and every place where the lanes cross has a traffic signal – at least twice as many as would be needed for a routine intersection. When the power goes out, this would require a squad of police officers to direct traffic through. Okay, okay, I’ll get back to nature photography or trashing religion shortly.